This entry was posted in Recovery & Support on March 5, 2014 by Platinum. The abuse of prescription medications continues to be problematic across the United States. According to the National Institute on Drug Abuse, approximately 7 million persons were current users of psychotherapeutic drugs taken non-medically in 2010 . Pain relievers are among the most commonly abused prescription medications, with over 5 million people estimated to abuse this class of drugs . Opiate drugs, including Oxycodone, Vicodin, Morphine, and Hydrocodone products, are frequently prescribed for chronic pain. Unfortunately, nearly one third of Americans experience persistent pain on a regular basis. Because opioid medications are effective in relieving physical pain, it is common for these prescriptions to be found in the medicine cabinets of individuals across the county. The danger lies in the regular and long-term use of opioid drugs, which can lead to the development of a physical dependence or addiction. The National Survey on Drug Use and Health (NSDUH) estimates that 1.9 million people in the United States meet abuse or dependence criteria for prescription opioids . Overdosing on opioid prescriptions has been responsible for numerous unintentional deaths, outnumbering those from heroin and cocaine combined . With the misuse of opioid prescription medications becoming rampant, new treatment methods are being sought to address opioid addiction. While current existing treatments for opioid addiction involve the use of medications, such as methadone or Naltrexone, the concern with this route of management are the potential long-term effects. Researchers have begun to investigate other alternatives for opioid addiction treatment, including the tactic approach of mindfulness. A recent study reported in the Journal of Consulting and Clinical Psychology described the investigation of a new treatment referred to as “MORE”, or Mindfulness-Oriented Recovery Enhancement, aimed at reducing opioid misuse. Researchers from the University of Utah found that mindfulness treatment influenced a 63 percent reduction in opioid misuse among participants, versus a 32 percent reduction in opioid misuse among participants using conventional support groups . The study found that the methods involved in the “MORE” treatment helped participants learn the difference between a genuine need for relief from pain and opioid cravings. Researchers also found that participants had increased awareness of opioid cravings. Elements of MORE include mindfulness training, savoring, and reframing perspectives. 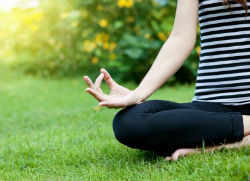 Mindfulness is a practice that originated in Eastern religions, though it has entered Western culture as a movement that promotes many mental health benefits. While further research is needed to determine the effectiveness of mindfulness on opioid addiction, this study is a great step in finding alternative treatments to prescription drug abuse. Treatments that combine conventional methods with mindfulness techniques may be beneficial in overcoming opioid addiction.